Twins Daily Roundtable is a new weekly series. As part of this series, a question will be posed to the site’s writers and they will respond in 200 words or less. This will give readers an opportunity to see multiple points of view and then add their own point of view in the comments section. Fernando Romero versus Shohei Ohtnai certainly lived up to the hype on Sunday. That being said, Ohtani knows his spot in the rotation will continue to be safe. Romero doesn’t have that luxury with players like Ervin Santana and Trevor May returning to the roster in the days ahead. Unless Romero experiences some sort of major backslide, his name shouldn't even factor into the discussion of rearranging to accommodate Santana's return. Right now the rookie right-hander looks like the Twins' best starter, and until that changes he needs to stick. Given the lack of long-term investment in them, Lance Lynn and Jake Odorizzi should be atop the pecking order. But with Erv likely a month away, the rotation landscape will probably look quite a bit different by the time he's ready. So, presumably Santana may be back in mid-June, so about a month from now. That's plenty of time for things to work themselves out, as they almost always do. Someone will need to be placed on the DL, a younger guy will be struggling. But, if that answer had to be made today, it would be difficult. At least somewhat difficult. Jake Odorrizi and Kyle Gibson aren't going anywhere. Jose Berrios is struggling right now, but he's not going back to AAA (subject to change if he's still struggling in a month. And, no one wants to hear it, but Lance Lynn isn't going to be dropped now (again, maybe in a month if he's still not throwing strikes). So, maybe the Twins should go the way of the Angels and use a 6-man rotation and treat Romero like Ohtani and the rest of the rotation works around the Romero schedule (purpose being to limit his innings). Fortunately, that answer doesn’t need to be made today. However, Trevor May could return from the DL in two weeks, and roster/rotation construction could get very interesting then. Ervin Santana or no, Fernando Romero needs to stay in the Twins rotation right now. The only reason not to do so would be to limit his innings for the first half of the year in order to use them in the latter half, and specifically the playoffs, so let’s chart that out a little. Following his Tommy John surgery, Romero pitched 90.1 innings in 2016 and 125 innings in 2017. He should likely be limited to ~150 innings in 2018. With his upside and injury history, stretching beyond that is just plain foolish. So let’s do the math. He’s at 37.2 innings right now, so that leaves about 115 innings. There are 126 games left in the season, so approximately 25 starts. Over his last three years, he’s averaged about 5.1 IP per start, which would be 133.25 innings, which means he would likely miss his last four starts if he makes every start. Assuming the Twins also want him available for a couple of playoff starts, that means shaving off 3-6 starts. That might be easy if he ends up on the DL at some point, so no need to panic now. So keep him in the rotation for now, with a plan to ease up on the innings mid-summer if he stays healthy and effective. Fernando Romero’s a 23-year-old who’s never thrown more than 125 innings in a season. Ervin Santana’s a 35-year-old who’s recovering slower than expected from a major finger surgery. Neither of those guys sound like somebody you can rely on to pitch into October. My short-term answer would be to insert Ervin into the rotation and piggyback him with Romero out of the bullpen in each of his starts. Santana is going to need some time to catch up, so you work him in slowly. It’s likely that an injury would open up a spot for Romero eventually, but let’s just say that doesn’t happen. In that case, I say once Ervin’s up to speed you roll out a six-man rotation. I think both Ervin and Romero could use the extra rest. The hope would be you keep everyone healthy and get fresher pitchers for the stretch run/playoffs. The fear would be altering the routine of everyone in your rotation would also result in everyone falling apart. Personally, I think a team like the 2018 Twins is perfect for such an experiment. Fernando Romero has been electric for the Twins in the early going. There's also the reality that it's been a very small sample size and the volatility with rookies is generally off the charts. That being said, he's a special talent and I've rated him highly on prospect reports given his potential to be the Twins ace for many years to come. Right now, I think it's hard to worry about what to do when Ervin Santana returns and in large part, because that timetable is so murky. Lance Lynn could turn things around by then, someone may be hurt, or another pitcher could falter. If we're still having to look for answers to this question when Santana is a week out, I think then it becomes a bigger talker. Until then, Paul Molitor has to hope for continued strong outings from his full staff and go from there. I do know that as the pitching crunch continues to come down the pipe, Phil Hughes and his remaining contract money is looking more and more like a big bite for the front office to swallow (but a necessary one). Short of something dramatic happening in a Fernando Romero start before Ervin Santana is deemed healthy enough to join the Twins rotation, I think it’s obvious what you do with Romero at that point. You send him out there to pitch in his Twins jersey every fifth day. The question becomes, what do you do with the other guys? Maybe one of them joins (or replaces) Phil Hughes in the Twins bullpen until one of the other rotation members falters or gets injured, but you simply do not take a guy who is literally allowing no opponent to cross home plate out of the rotation in a season where you’re honestly trying to win your division. I suspect the situation will resolve itself the way these things so often do. A starting pitcher that has given up a run or two more than they’d like to see will suddenly suffer an “impingement” in his throwing shoulder or a “strain” in his arm, necessitating a 10-day stint on the DL. There are still a few starts to be had by Romero before decision time, but as of now you can't take him out of the rotation. There's also a doubleheader on June 5 that would require a sixth starter or pitching a guy on short rest later that week. Having too many capable starting pitchers is never a problem... and it won't be here either. Short answer: He should stay in the rotation. I think Fernando Romero needs to stay in the MLB rotation upon the return of Ervin Santana. If everyone in the rotation stays healthy, I don't think a six-man rotation is a bad thing for a few reasons. First, for Romero's sake, it would help the Twins limit his innings this year, as he has never thrown more than 125 in a season. Second, it will help keep everyone in the starting rotation fresh throughout the season as they get an extra day's rest between each start. Next, the Twins don't have a front-line ace in their rotation, so it's not like they will be taking starts away from someone like a Max Scherzer or Corey Kluber. Finally, someone else in the rotation will inevitably get hurt, and when that happens the rotation can simply go back down to a five-man rotation without skipping a beat. Right now, we are evaluating Romero's initial performance through rose-colored glasses, and rightly so. He's been dominant against two really good teams. He's likely to run into bumps in the road as teams adjust and see him more. If he keeps pitching the way he has been, there's no way the Twins, who have less margin for error after a difficult start, can push him out of the rotation. I don't think it's debatable, even at this early stage, that he has the best stuff on the team. Right now, Lance Lynn is the odd-man out (performance wise) in the Twins rotation. This decision likely depends largely on what the Twins decide to do with Phil Hughes. Are the likely to cast aside an arm who is making $26 million over the next two seasons? I'm doubtful, although that's absolutely what they should do from a baseball standpoint. I think it's likely that the rotation logjam works itself out naturally. The chances of the Twins starting staff staying injury free seems unlikely, in which case Romero stays occupying. Ultimately, I think it's hard to argue that right now, the optimal Twins rotation would be: Santana, Berrios, Romero, Gibson, Odorizzi. We'll see what happens at the end of May, but Romero has undeniably provided some much needed spark and swagger to this pitching staff. There is no evidence that limiting innings growth prevents injuries. * If he pitches well, he should stay in the rotation. Unsure about a six man rotation. I'd probably move Lynn to the bullpen, but I wouldn't disagree with a six man rotation if they go that way. *The verducci effect is bunk. And no, we aren't taking about going from ten innings to two hundred. yeah, this one isn't tough. Odorizzi is pitching well. Lynn is not. If Romero continues to pitch well, and no one gets hurt, Lynn is the first one to the pen. I could potentially see a 6 man rotation if the team is set on getting Romero to pitch as a starter in the playoffs, but I suspect that they exercise May's option if no one gets hurt. But someone always gets hurt, so I'm not too concerned about this just yet. If we are indeed trying to win the division, Romero has to stay in the rotation. As we speak, Lance Lynn is making it easy for Twins to take him out of the rotation. He can't use the "signed late so I'm still in spring training" as an excuse. His WHIP today after two innings is 2.5 which is even scarier than his season ERA of 7.68. He is not a part of our future. He has little to no value right now so he goes to the bullpen and takes over Hughes' role of "pray you don't need to use him" or "not even he can embarrass us any worse". With Lynn hitting 95-96 and getting Ks, maybe he can develop some trade value, which Hughes will never have again. We finally have a rotation of which to be proud, and we can't afford to coddle players who aren't performing since we have better solutions. Unless Santana and/or May prove that they are better than another pitcher currently in the rotation, they should be in the pen and/or AAA for rehab (Santana) or option (May). Lynn is the weakest link right now, followed by Odorizzi. I originally responded to this question on the 9th. We've seen another poor Lance Lynn start since then and he appears to be working on yet another one this afternoon. If he keeps this up, the Twins will have a much easier time of figuring out what to do. Twins need to be thinking about making a change regardless of Santana's return.Need to be thinking about moving Romero out of the 5 spot and into top 4 so that he's starting every 5th day no matter what. Even if there's an innings limit, you don't defer the innings of one of the best pitchers.The only way to make sure that there are important games in Sept and Oct/Nov, is to win games today, and hope good fortune and hot bats can bring you home.Unless the Twins think that extra rest between starts is going to be the difference between Romero struggling and being great, they need to consider moving him into the top 4. I'd call up Slegers and move Lynn to the bullpen and cut Hughes. I really like Tom's suggestion.Piggy back him with Santana.Yes, that would mean one less arm in the bullpen.BUT, the entire bullpen would get a day off every 5 days.Just may work. Begin with Romero going 5-6 innings with Santana coming in to finish it.After a few of those games, flip so that Santana comes in and pitches 5-6 innings with Romero finishing.If Romero only pitches 3+ innings every 5th day for the last half of the season, his innings should be fine and his arm fresh for the playoffs. Pretty lame how many didn't answer the question by saying "Something will happen next two weeks to make the decision for you." 1.) Lynn to the pen. He knows he has two weeks, if not he's pen bound. 2.) Six man rotation. This maybe makes you cut Hughes but that's something you might just have to do. But overall, answer the question. Lynn to BP, get rid of Hughes. That's how I see it at this moment. Doubt my feeling will change in a few weeks. Lynn to pen demote Rogers if his era is still over 6.00. Lynn needs to get the same speech Hughes got a few weeks ago. Thank you for that. I have been preaching for quite a while and felt like a voice in the wilderness that no one pays attention to.I believe the Twin have been at the forefront of trying to "protect" their pitchers arms through the theory of innings limits and pitch counts for well over a decade and if the result has been that they have fewer arm problems than other teams it would be tough to argue against the theory. Is that what has happened? Does any one think the Twins' pitchers have had fewer arm problems than the average? I believe, without doing any research that Romero is just as likely to hurt his arm in the first inning of spring training as he would be on his 180th inning.Common sense approach would be to skip starts if fatigue shows up and to watch for signs of overthrowing or tiredness during a game regardless of inning or pitch count. Catchers and pitching coaches should be aware of when a pitcher is not following through, losing command or losing smoothness in mechanics. Now on to the actual issue.How about meritocracy?Crain and Liriano both voluntarily went to the minors in their day because of ineffectiveness. To their credit they figured things out and earned their way back.How about Lynn doing the same thing?His walks per 9 stands at 6.6 and just got worse today.Having a guy with 7 walks/9 makes no more sense in the bullpen than it does in the roation.As it stands, Gonsalves or Slegers should be coming up to replace Lynn.Santana and May should have a period of time in the minors proving they are ready before they are considered for promotion. No use pondering what to do them on the Twins until they show maybe two weeks of being effective in the minors.If at some point every one is pitching fantastic then you have to consider bull pen assignments and trades.Not holding my breath. This is not a real issue to me.I see both the future and the present tied together.Berrios and Romero are in the rotation and they will be the future.They need to stay! Berrios has some rough patches, but his 7 innings against St Louis showed the pitcher that he is.Leave him, leave Romero.Will Santana be as good as he was? Hopefully we have a double header and he takes the mound and shows what he has. If he goes further and looks like last year.He follows Berrios and Romero. ​Gibson, if he continues is 4, Odorizzi is 5.May and, do not forget, Gonsalves are six if the need exists.Lynn looks like he needs bullpen therapy, Hughes is out. Next up: fix the bullpen. Pfft. This is easy. Lynn goes to the dl and is replaced by Santana. May replaces Hughes who gets DFA'd. If you can find a way to fit Gonsalves in I'd be impressed. Ervin and someone else in. May perhaps. Perhaps a rotating AAA reliever. Unless Lynn starts throwing strikes I would say his spot on the team is very much in jeopardy. Let’s put it this way. It isn’t a decision most contending teams would think twice about. If the Twins think twice, it will show that Jim Pohlad is more in control than we perhaps thought. If Romero is pitching even close to as effective as he is when Santana returns and htey remove him from the rotation and/or send him back to the minors I am no longer going to be a fan of this team. Just leave him in the rotation.Let him go through a complete MLB season as a starting pitcher.If he takes some lumps down the line, then that is the right of passage for young pitchers.The person he replaces in the rotation is obvious:Lance Lynn.I get we paid him $12 million, but he is only on a one year contract and he has been terrible.Let him spot any starts that need to be spotted and pitch in long relief.Maybe somewhere he gets back to his former level, but I am not going to remove Romero from the rotation to find it.He is only here for one season anyways. Yeah, if demoting Romero is even considered, then the FO is still in building mode, and not in win mode. Romero stays in the rotation. Lance Lynn makes this a non-issue with his well below replacement level contributions. If Romero's workload needs to be managed, there are many ways of doing that. The reason it may need be managed is that pitchers who have been injured are the most likely to get injured, not because of the verducci effect. My problem with a six man rotation is a numbers issue.Six man rotation plus, what, eight man bullpen plus eight position players plus DH plus back up catcher = 24. Maybe someone can explain how increasing the starting rotation would decrease the BP number. Every pitcher in the rotation, except Berrios have been injured. Lynn, Gibson, Romero have all had TJ, Odorizzi has had back injuries. Every arm in baseball is a ticking timebomb. I've yet to see evidence that a specific method of managing innings or pitches or anything else changes that. At this point Romero HAS to stay in the rotation. He’s pitched well against very good competition. Now if he falls off and hits a mental wall then sending him back to AAA or putting him in the bullpen makes the most sense. I expect he’ll hit some rough patches, but he has a.the stuff, and b.the mentality to prevent him from losing his confidence to start in the Bigs. If anything Lynn needs to be released or sent to the bullpen. He hasn’t pitched up to his potential and sending him out is expecting to lose that game as he hasn’t shown anything that he’s the pitcher we envisioned when we signed him. Trevor May either has to continue rehabbing in the Minors or accept a bullpen role as of now. To be fair to May he doesn’t have anything right now that screams he’s a better starter than Romero. As with Santana I think once he gets back you have to go with a 6 man or drop the dead weight in the rotation, and for the money that dead weight looks like Lynn. 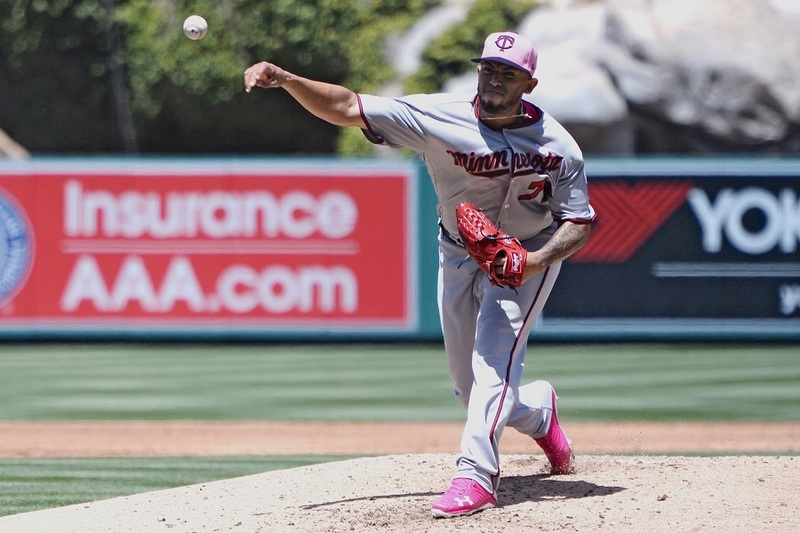 If Romero hits his innings limit so be it, but with each start he has made the case that he belongs in the Minnesota Twins rotation, if the Twins botch this their season might not end up where they want it to, especially since Romero has given the rotation a shot in the arm recently. If Romero continues to pitch like this, and they send him down to burn innings in AAA, I'll be convinced that I'm living in some long-con, Truman Show-like "punk'd" prank that the whole world is in on. I look around me, and I'm nearly certain that's the case. But, that would really be the coffin nail. The rotation considering optimal health, IMO, should be: Santana, Berrios, Romero, Gibson, Odorizzi. May should be eased back in the bullpen this year. Lynn should be thrown out into the pen as well, but I have the feeling they'll give him 1 or 2 more starts then DL him if he can't pull it together. Phil Hughes is cooked, and shouldn't be on the team. It's ridiculous to think that he's returning any value in that 12 million by losing games. Cut bait. If Santana struggles mightily, which I expect, you have Lynn there with Gonsalves ready for the call as well. I would also use those guys to skip Romero occasionally to keep his innings down. I would rather allocate more of those limited innings to the second half. I'd love to have that card up my sleeve for a 163, Game 1 of a playoff series, wildcard play-in, etc, even if that would be his final start of the year. Thats the best rotation this team has had in a long, long time.